Mrs. Dorothy and Calla preparing for their Showmanship class at the 2015 Martinganza. Photo courtesy of Kennie Williams. They say you can’t teach an old dog new tricks. 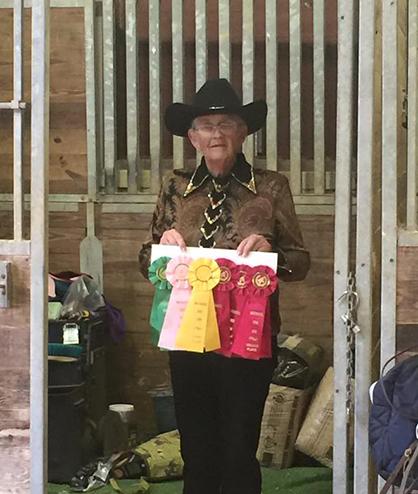 But when it comes to showing horses, 72-year-old Dorothy Grimes believes it’s never too late to learn, never too late to try something new, and never too late to live out your passion. 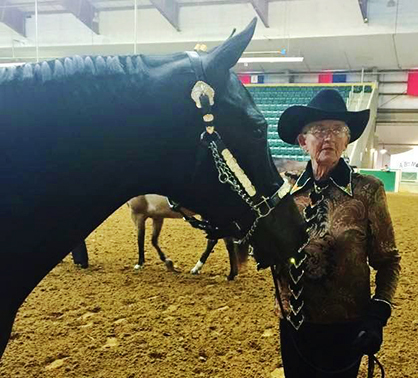 Grimes, who turns 73 this August, competed at her first AQHA show last weekend at the 2015 Martinganza in Williamston, North Carolina. With some encouragement from her youngest daughter, Kennie Williams, Grimes was introduced to an entirely new set of classes. Although Grimes is new to the AQHA show scene, she is a lifelong equestrienne. She remembers the exact day, nearly 61 years ago, when she received her very first horse. Winner Winner, Chicken Dinner! Photo courtesy of Kennie Williams. Thanks to a tricky hip and a few ailing joints, Grimes doesn’t ride anymore. However, there is no question that horses continue to play a big part in her life. For Grimes, in-hand classes like Showmanship and Halter provide the perfect solution for the more seasoned equestrian who still wants to be involved in the sport, but may have some physical limitations. Grimes does admit there is a learning curve that comes into play when you return to the show pen after a decade or two. A little misunderstanding in one of her Showmanship classes at Martinganza made for a unique learning experience. After her daughter posted pictures from the horse show on Facebook, Grimes received numerous comments touting her as being as inspiration for all generations. She’s not quite sure about all that. Still, Grimes is thankful for the support and would like to take a moment to share one final message.